Without little argument, anglers around the world agree the wahoo is the fastest fish in the ocean reaching speeds up to 60 MPH. They are found all over Costa Rica, but they usually travel alone so catching one is always a challenge. With fast, scorching runs the only thing that is better than the fight is the fish itself. The delicious fish is only made even more exquisite because of its elusiveness, so the wahoo is a true delicacy among fisherman. Trolling with live bait is your best bet when trying to catch this speedy, intelligent fish – but be sure to have a wire leader on or they’ll bite right through you! DESCRIPTION: Wahoo are found all over the world in tropical waters. An off-shore species, wahoo are thought to be highly migratory as well. They are often loners, though they can be seen swimming in groups of 2-5 fish. Easily recognizable by its intimidating jawline and razor sharp teeth, wahoo also have stunning blue color on their backs and stripes along their sides. Whether its fresh sashimi on the boat or grilled back at home, you may not put a better tasting fish in your mouth. FEEDING HABITS: Wahoo are found near wrecks, reefs, and pinnacles – but are also found off-shore with other pelagic fish. With their speed and teeth they can eat just about anything they want. Though they rarely jump, once they are hooked they are famous for their screaming runs that can burn out your reel. 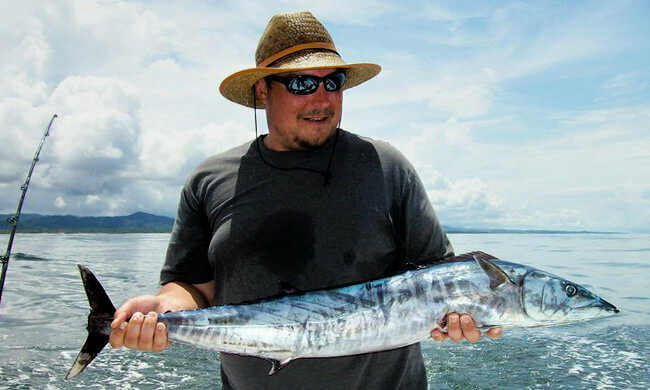 SIZE: Wahoo in Costa Rica are typically 20-30 lbs, but we see a lot of 50 lb fish as well. The more mature ‘hoo tend to be thicker around the mid section, which of course means more meat for the boat! WHERE FOUND IN COSTA RICA: Wahoo are found off both coasts throughout the entire year. They have been seen and caught in-shore near reefs, but the majority are caught when trolling off-shore for other species like dorado and sailfish. BEST MONTHS: Wahoo don’t play by anyone’s rules, so they can be caught every month of the year here. We do see more of them in the green season months from May-September, but they are also spotted in the cobalt blue water from Jan-April when billfishing.